A lot of people would be fine just spinning tunes that make people dance in a club, lounge or what have you... You, on the other hand, would like to take it to the next level. Well, here are 8 tips to take your DJ set to the next level, so you stand out from the rest. Stop thinking of yourself as a DJ and think of yourself as an entertainer. That's pretty much what a DJ is supposed to be anyway. People are there to have a good time, and you're there to provide that for them. When a lot of artists hit the stage, their mentality changes and they become one with the music, one with the decks, one with the instruments and so forth. They also create a different charisma from who they are in person, off stage. Sometimes the on stage presence can become iconic (Deadmau5's mouse head, Daft Punk's robots, but you don't need to have a costume). It's about creating your persona and whatever style you want the audience to grasp so that it's not just through your music but also through your presence. This may be hard if you don't know how to create graphics, and especially if the clubs you play aren't fully equipped to handed visual projections. However, if you do have the time and extra money, get some visuals into your set. It does wonders. As an example: although I outgrew Tiesto's music, his visuals are damn amazing (even though he's got a lot of dough to pay for it). If you do decide to go the visual route, make sure the design fits with your persona, there's nothing lamer than visuals that don't match the music. Step outside your little electronic (or whatever) world for awhile and discover other artists from other mediums. This will only help you understand yourself and find ways to make your performance better. And above all you'll appreciate all the different forms of art and why it's important. 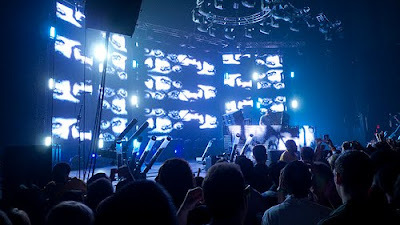 Take notes of what you liked about their performances: Tiesto has that circular stage with giant graphics on the screens; Deadmau5 wears an LED mouse head while spinning tunes from tilted cube; Etienne De Crecy does his DJ set in a weird cube like contraption; The four members of Kraftwerk stands stoically in front of a laptop computer stand... You get the idea (however not everything has to be distinctly visual). This can either be scratching or learning how to use a certain effect really well. Now, not all DJ sets require tricks or this kind of talent, in fact, it may turn some people off to be abused by your technical prowess. However, if you understand when and where to use these tricks the better equipped you are (James Zabiela is great at this). Some instruments can become to cheesy or gimmicky, so watch out for that. As an example I've seen drums brought to a DJ set but all they did was play the beat of the track that already has a beat... So "why the hell do you need the drums anyhow?" Unless you are Travis Barker and can take drumming to a whole new level with a DJ set, just leave them at home. I am not saying drums don't work, just bring something fresh to the table. Other instruments like synthesizers and midi controllers work well, but who knows, with the right feel and creativity any instrument could work. I think that is the most unique thing you could do because it is all your music... and hopefully your the only one that has them (or just the awesome hidden gems that you haven't given away). Just make sure other people than yourself like your music. Whatever it is that you want to do, just make sure people remembered you for having a great time... And are willing to see you perform again.